The beautiful and talented Sankari Wegmen and her friend Brooke have a fun challenge called Cinema Saturdays. They pick a movie and you make a card based on the movie. Super fun! This week, they are celebrating their 50th challenge! And they picked Pretty Woman as the movie. So, I kind of messed up on the challenge. This week's challenge was actually Pretty Woman AND paper piecing. I forgot that last part. :( I'll try to make another card soon. Hopefully, I'll have some time. But this is what I made. 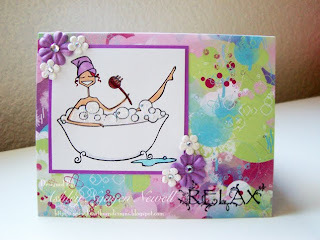 I love the scene where Julia Roberts is in the bathtub so I picked this cute Stamping Bella image. The paper is Basic Grey. The sentiment is Unity from the June KOTM. The flowers are Prima and the rhinestones are Darice. I covered the bubbles in Star Dust Stickles but it's really hard to see when I get the proper exposure on the pictures. Anyhow, check out the challenge and don't mess up like I did! Happy Sunday! This is a really cute card! Love the bathtub theme, great take on the challenge! Oh, I love this Bella! It's the perfect image for the bathtub scene!! You're so clever!! This is so darling Ashley!!! I LOVE that scene in the bathroom too - so cute - and your card is perfect!!! I LOVE that DP and Bella is so darling!!! ANd I am SO thrilled and happy that you played along with us!! YAY!!!! Thank you so much for playing and I hope you had fun!!! YOU are such a sweetheart!!!! Sending you a ton o sunshine! This card is so cute. I love the bubbles...I could see the sparkle when I enlarged the photo. I was hoping to see a bathtub! Great job!! I love your sweet little card! I just love this card!!! You did a great job picking out the colors they are so perfect for a Bubble Bath!!! Ah I think I need one now too!!! I have never participated in that challenge, but I have seen lots of people who do I have got to check it out this week!!! This is beautiful! You didn't mess up at all! You could just paper piece her towell or the tub and attach to this if you wanted, but it's beautiful just the way it is! I love that bright paper. What a fun challenge too! Love the bath tub theme - who didn't like that scene?! ;) Nice job! This card is so cute! The image is perfect for pretty woman!